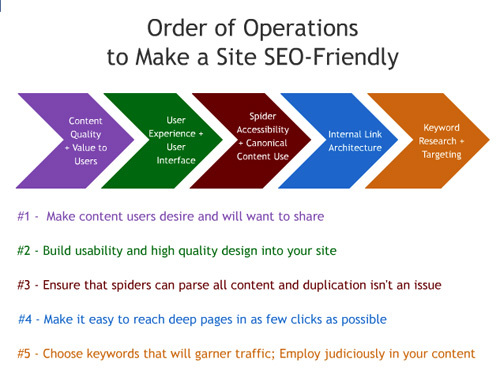 Let’s take a look at each of these SEO Strategies. Make content users desire and will want to share. Content is so important for SEO. When you think about what your target market is looking for, think in terms of what words they might use to find you. Those words are what will become your keywords. However, you may have more than one product or service so you will need to have different keywords for each of those and a separate page on your site for each. When you are writing content for your site, use the keywords you have researched for each page in a natural manner. In other words, don’t stuff keywords in to every sentence. Just make your page interesting and informative and easy to be read.Keep your content fresh. Nothing is worse than coming to a site and finding that all of the information is 3 years old. A great way to keep fresh content rolling out is through a blog. Build usability and high quality design into your site. Make sure that when people do find you, that you are delivering the information they seek on an easy to navigate site that is pleasing to the eye. Avoid the use of too many rotating pictures and flash elements. Think about how your site will look on a smart phone. Clean and simple is best. Make sure your pictures and other graphic elements are optimized to load fast. It is frustrating to people who visit your website to have to wait for you pages to load. Make sure spiders can parse all content and duplication isn’t an issue. This kind of goes back to high quality design. If your site is created entirely (or even mostly) in flash, then you are making it very difficult to be crawled by search engine spiders. Keep those flash elements to a minimum or eliminate them entirely. Be sure all of your pictures and graphics have alt tags that accurately describe them. Search engine spiders can’t “see” pictures, but they can see the alt text behind the pictures.Look at your pages and see if you are duplicating content. Search engines may discount duplicate content. Try to keep the content on each page as original as possible and make sure your content is original to your site.Be sure to include an XML Sitemap on your site. This allows spiders to know the location of all the pages on your site, when they were last updated, as well as other information about your site. Make it easy to reach deep pages with as few clicks as possible. Your navigation is a very important part of your site to consider. Try to keep the number of clicks to get to any page on your site to a minimum. For pages deep in your site, try to keep it to less than 3 clicks. Use keywords that will garner traffic. Use judiciously in your content. Research your keywords carefully. There are free tools available like the Google Keyword Tool. There are also some wonderful tools integrated into paid solutions like the Keyword Grader in the Hubspot Inbound Marketing Software. As we said in the 1st strategy, use the keywords judiciously. Use these strategies to get your website found and indexed by search engines and drive traffic to your site! Businesses should pay attention to the SEO on their own websites as well as using social media to drive traffic to their sites. Use one of the keyword tools to research possible keywords for your site and see if you are using them well. Keywords change over time, so remember to do this on a regular basis. If you would like to learn more about the Hubspot Inbound Marketing software, contact us at Wharton Website Design and Marketing. 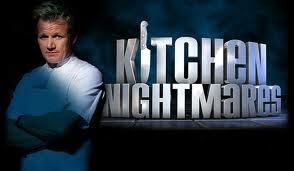 Have you ever watched the TV show Kitchen Nightmares? On the show, Chef Gordon Ramsey goes to restaurants that are in trouble and tries to help them get headed in a direction that will bring them success. It seems in many cases the restaurant owners in the show have lost their way. They don’t have the passion they need. They let their employees run the business while they hide in an office or the bar. They don’t have methods in place to check for quality. When Chef Ramsey comes in, there is often a lot of yelling and tears and resistance to change, even though it is clear that, without change, the restaurant will fail. So much drama! How would your internet marketing plan stand up to someone like Chef Ramsey? Does it showcase the passion you have for your business? Does it include clear strategies and tactics to reach those objectives? When you are marketing on the internet, you don’t get to see your customer face to face. You may not know if your customer is unhappy with your product of service. Your internet marketing plan needs to include a way to interact with your customers to get feedback. Social media is a great way to accomplish this. It can be a bit difficult to show your passion on the internet. Blog marketing is a great way to show your passion and expertise. You can also get comments and interact with your customers this way. People who visit you on the internet don’t know if you are hiding in your office. However, they do know if you respond in a timely manner to them when they submit a form or place an order or make a comment. Part of your plan may need to include a plan for timely responses. Of course, you don’t need the drama, the yelling, the tears, etc. Your internet marketing plan can save you from the nightmare. Even though you are not face to face with your customers on the internet, you should plan for ways to interact with them. You should find ways to show your passion for your business as part of your internet marketing plan. Look at your internet marketing plan and make sure you are showcasing your product or service in a way that is helpful to your customer. Leave a comment telling us and others how you use your website, social media, or blogging to interact with your customers as part of your internet marketing plan. Whenever you are looking for content for your website, your business Facebook page, Twitter account or any online presence for your business, keep one thing in mind . . . IT’S NOT ABOUT YOU! And, by the way, it is not about your web designer either. It is about your CUSTOMERS! What can you give of value to your customers? You may think the video with music or the flashing images are cool, but will your customers? Or, will they just find them irritating and distracting. When your customers find you, can they find useful information? Can they navigate easily? Can they easily contact you. What is your customer’s experience with your online presence? Is that your web strategy? All your customers are on the web so you should be too, right? How can a website help you with your overall business strategy? If you don’t really have a plan going in, a website may not really help you that much! A website should help you showcase your strengths and should support your business strategy. A website should be designed to help you reach your target audience and turn them into customers. Building your web strategy as a part of your overall business strategy is the first step to building any kind of website. We’ll be looking at some of the other steps involved in the next few days. Stay tuned! The saying in real estate is “location, location, location!” Where you locate your business matters. You want to be in a good neighborhood. If you are selling clothing for children, you obviously do not want to be located next to an adult novelty store! The same goes in the internet world. Where is your site located? Do you have good neighbors? I was researching a site this morning that was on a server with over 5,000 other sites. Of those sites, 5 were tagged as being potentially “adult oriented” and that could hurt the innocent site I was researching. If search engine filters decide that you are in a bad neighborhood it will impact every site on that server. They could potentially put a block on that IP! What if you are in a neighborhood with spammers? Or even a neighborhood with sites that use the host mail server to send out a lot of emails or load lots of un-optimized pictures? These servers could be affected not only by being flagged, but also by being really slowed down while the server is processing the sending of all those emails or downloading all of those photos. How do you know who’s in your neighborhood? Go to You Get Signal and check out the reverse IP domain check. If you see any problems, contact your hosting company and let them know your concerns. Don’t let bad neighbors hurt your business! Here is our roundup of some of the most useful and interesting internet marketing news out this week for business. Last week I introduced some of the resources that the ASU SBTDC consultant use when conducting Market Research about a particular industry, I hope you found it helpful. Today I want to focus on effective market research tools to help learn more about your potential customers and how they buy. DemographicsNow database -provides extensive demographic information about households and basic consumer expenditure data on trade zones (by zip code, town, county, MSA, state or region). Hill Library New Strategist Demographic eBooks, over 30 on-line books with specific information about how much consumers spend on a wide variety of products and services broken out by demographic sub categories. One example is “Who is Buying Apparel” and “Best Customers: Demographics of Consumer Demand” eBooks to get detailed expenditure information on jewelry by a variety of demographic sub categories including income, age, education, and more. This information combined with the county household demographics will determine not only overall county demand for a product or service and segment the households to find out who the best potential customers may be. Hill Library Special Issues database, for industry reports outlining the trends of the past year and forecasts for the coming year. The Arkansas Small Business and Technology Development Center network offices are all paid members of the Hill Search Library which means that their clients have access to all of this data through the center at no charge. Plus the ASBTDC staff provides free assistance in analyzing the data and helping the client make decisions based on the information. There is no charge to be a client, nor for any assistance through the centers. Finding good, reliable market research data is possible. It is just a matter of knowing where to look. The Hill Library is an excellent tool, or using the free services of the ASBTDC to help develop initial market research. Next week, “drilling down” to find customers in your trade zone using Dominant Tapestry Segmentation programs.